Have you read TSIA’s “The State of Managed Services 2018”? If not, you should. It perfectly summarizes the sheer force of change of managed services. To quote the report, “Technology-as-a-service is the single most disruptive force since the inception of information technology,” which is so true. Managed services is transforming how technology is deployed, operated, and optimized. But, when it comes to how managed services are sold, it’s an obsolete, inefficient, jungle of spreadsheets and Word documents that haven’t changed in decades. In this blog, I will explain how Managed Services companies are replacing spreadsheets with CPQ technology and enabling even more disruption to come. Pricing managed services often includes numerous variables and calculations. The variables could include labor, number (or types) of devices or servers, software, hardware, or any combination. Cost could be based on internal capabilities or it could be supplied by third-parties. Finally, managed services are delivered over specific timelines with the goal of renewal, so it’s not a one time sale—and it’s not a project with natural end. This growing industry is transitioning to new business models. The volume of sales quotes has gone up while pricing complexity and the spectrum of services offered has increased. Despite this, pricing is still largely done in spreadsheets, which is slow, expensive, error prone, and it limits resource demand visibility for the delivery team. Worst of all, introducing new service offerings (with new pricing, terms, discounting strategies, proposal content, etc) is very difficult and slow to implement when it’s all managed in spreadsheets. But here’s the problem: pricing (in spreadsheets) and proposals (in Word) are data silos, except through manual effort to combine them into a final sales document. This means the proposal content is static—it’s not dynamically linked to pricing. So, the pricing and proposal content have to be manually updated for each iteration or change. Even a modestly high volume of proposals makes this process manually intensive and increasing distant from the automated world of today. 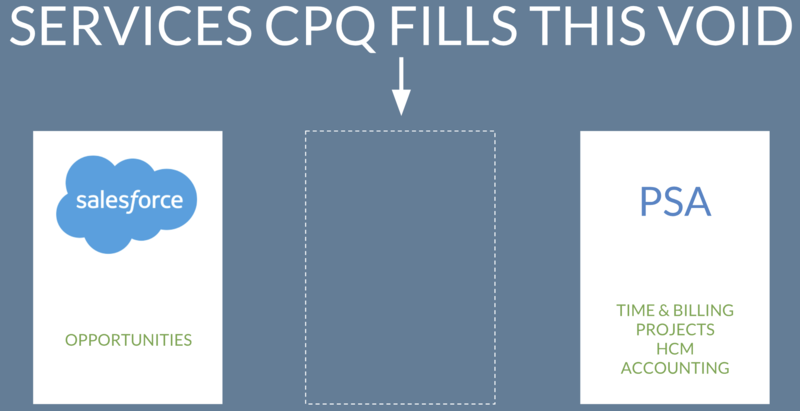 Services CPQ is an industry-specialized version of CPQ. Where most CPQ products are designed for selling products, Services CPQ is built for selling enterprise services like managed services and professional services. Rather than replace CRM (customer relationship management) or PSA (professional services automation) applications, Services CPQ fills the the universal void between opportunities in CRM and delivery details in PSA. There are catalog, proposal automation, and analytics tools on the market today, but not all in one application designed for selling technology services. This distinction is key as Services CPQ replaces spreadsheets, Word docs, and email approvals with a services catalog, pricing, automated proposals, rule-based approvals, and analytics. 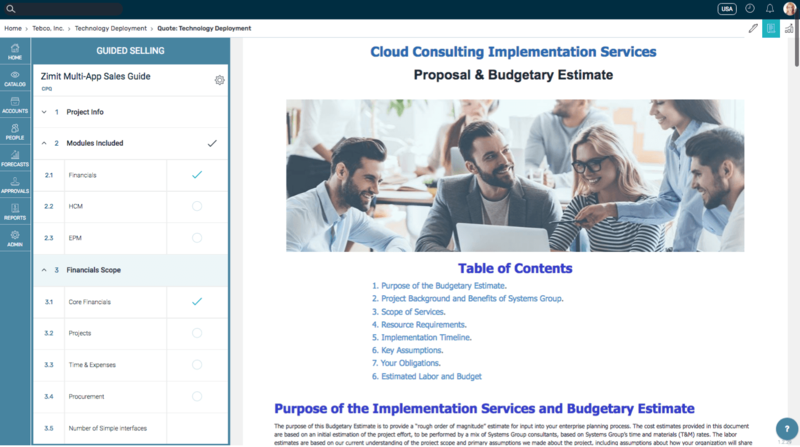 With Services CPQ, in just a few clicks, a salesperson (or a sales support team) can answer guided selling questions and auto-generate all the details of a managed services proposal: service offering, cost, price, timeline, roles, rates, and the proposal content. This makes selling managed services radically faster, more consistent, and less expensive. CPQ for Services: Answer guided selling questions to auto-create all pricing and proposal content. What if you could go from an opportunity in CRM to project execution in PSA without ever touching a spreadsheet? What if you could provide real-time resource demand visibility to the service delivery teams? This is now being pursued and attained by managed services teams. This efficiency unlocks new capacity resulting in new services, faster revenue, better margins, and lower customer churn. What is your Services CPQ strategy?